The sun's out and you know what that means—it’s the perfect time to wake up your wardrobe. How? By experimenting with playful hues that not only make you stand out from the crowd, but instantly boost your mood. It's a win-win! If you’d like to try sporting summer's brightest hues, here are three quick tips to keep in mind. Show your brights! Pair them with neutrals like cream, off-white, grey or tan to make them really pop. Go color crazy. Pair poppy brights together—just be sure to wear complementary colors that pack a punch but don’t clash. Mix it up. Give bright print and pattern-mixing a whirl. The bolder and more vibrant the better, and there are no rules here—the wilder the better! Keep scrolling to see more pointers on how to wear brights. The thought of wearing colored pants can be daunting, but fear not—it’s easy! Try out a versatile hue like fire-engine red or poppy. Accessorize with sassy accoutrements like an animal print clutch and tonal d’Orsay flats, and ground the look with a striped tee or white button-up. Stylist Tip: Stripes, leopard & color—oh my! If this combo is feeling too adventurous, swap out the patterned top for a white or chambray button-up instead. Yes, you can wear yellow! Whether you’re drawn to marigold, canary or mustard, this happy hue is the perfect color-blocking base. Pair it with a contrasting classic like a sleeveless trench in navy. A long layer is a great sidekick to a new trend—it can pull almost any look together. It’s all in the blue family! From turquoise to cerulean, mix & match tonal separates for a cool take on the monochrome trend. Leave your top untucked for a flirty (& breezy) feel—it should skim at or above your hips for a balanced look. Stylist Tip: Invest in a pair of bright pumps! Colors like cobalt, fuschia and red can be worn as neutrals year round. Ask your Stylist for a pair in your Fix Note! Want to take on brights? 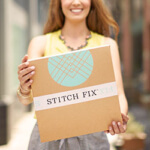 Let your Stylist know in your Fix Note!